Fire extinguishers are devices commonly found indoors and are used to douse fire and prevent its spread. They are small metal canisters that contain compressed gas (usually nitrogen) that, when activated, propel a directed spray of flame-retardant chemicals. Fire extinguishers are only effective if building occupants understand where and why they are used. 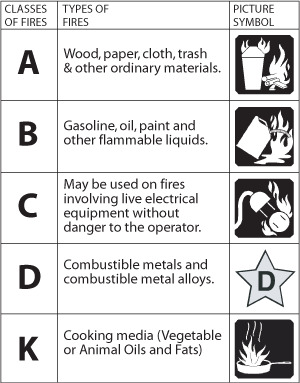 “D” class – Fires resulting from combustible metals, such as sodium, potassium, titanium, and magnesium. These fires occur mostly in chemical laboratories and are rare in most other environments. Dry Chemical – There are two types of fire extinguishers that use a dry chemical. One is called “multi-purpose dry chemical” and uses ammonium phosphate as the extinguishing agent, which is effective on “A,” “B,” and “C” class fires. This chemical is corrosive and must be scrubbed from surfaces after use. These types of extinguishers are very common and are found in schools, homes, hospitals and offices. Sodium bicarbonate is used in extinguishers known as “regular dry chemical,” which are capable of handling “B” and “C” class fires. These extinguishers are found in garages, kitchens and laboratories. Sodium bicarbonate is easy to clean and non-toxic. Water Extinguishers – These extinguishers are most suited for “A” class fires. However, they cannot be used in “B,” “C” or “D” class fires. In “B” and “D” class fires, the water will spread the flames. In a “C” class fire, the water is conductive and poses a risk of electric shock to the operator. However, the misting nozzle of a “Water Mist” extinguisher breaks up the stream of deionized water so that there is no conductive path back to the operator. Since the agent used is water, these types of extinguishers are inexpensive and environmentally friendly. Wet Chemical Fire Extinguishers – These devices are designed to combat “K” class fires and commonly use potassium acetate. They are appropriately employed in commercial kitchens and restaurants, especially around deep fryers. The chemical is emitted as a fine mist that does not cause grease to splash onto other surfaces. They can also be used in “A” class fires. check that a portable fire extinguisher exists within a 30-foot travel distance of commercial-type cooking equipment that uses cooking oil or animal fat. check that a portable fire extinguisher is within 75-feet of travel on every floor. check for the presence of portable extinguishers, and determine that they are located in conspicuous and readily available locations immediately available for use, and not obstructed or obscured from view. confirm that access to extinguishers is not obstructed. make sure that the hose (if so equipped) is intact and not obstructed. make sure the pressure dial reads in the green or “charged” area. It should also be clear and readable. check that the pull pin is securely fastened within the handle and held in place by the tamper seal. check for visible dents or cracks in the extinguisher body. check that the extinguisher is in its proper location and mounted correctly. check for modifications that might reduce the extinguisher’s functionality. make sure that the fire extinguisher has a label and that is is legible. determine the adequate number of fire extinguishers needed or their ratings. c. where there is corrosion that has caused pitting, including pitting under a removable nameplate or nameband assembly. Small fires can be controlled through the use of household or commercial fire extinguishers. A household extinguisher can often completely douse a very small fire and prevent the need for professional assistance. Even if a fire cannot be completely doused, a homeowner can potentially control a blaze long enough with an extinguisher for firefighters to arrive. Fire extinguishers should not be used if the operator is not sure they have the proper type of extinguisher, if they are not sure how to use it, or if they cannot avoid smoke or are in imminent danger. If the operation of an extinguisher will place building occupants in danger, they should evacuate the building and wait for fire crews to arrive. essential information about the types of fires they can combat. Newer devices have pictures that correspond directly to the fire types listed above. Older models have letters serve the same purpose. Fire extinguishers expire and they do this for a few different reasons. One common way is that, over time, the seal on the neck will weaken and allow compressed gas to escape. Extinguishers that have lost much of their pressure will not operate. Pressure within an extinguisher can be conveniently checked through a pressure gauge. “ABC” class extinguishers (ammonium phosphate) have the tendency to fail due to solidification of the chemical in the canister base. Homeowners and inspectors can delay this process by periodically shaking the extinguisher. Expensive extinguishers that have expired, especially those designed for commercial use, can be refilled and resealed by companies who specialize in this service. Inexpensive models are disposable.